EVRI multi-device charging station is a game changer for folks (like us) who want to charge a laptop along with other mobile devices in a tidier and more convenient—not to mention super fast—way. Founder Michael Ma created the OneAdaptr TWIST universal travel adapters after a work trip charging conundrum. With EVRI, his focus shifts to at-home charging needs. The slim hub plugs into the wall and has four quick charging USB ports and one USB-C port. You can charge phones, tablets, laptops and more at the same time and at full speed, which should keep everyone in a household happy (and powered up). There are different tips to connect to a variety of laptops and a stand to help keep it cool. We tried EVRI out and appreciated how it eliminated the need for the bulky Mac laptop charger we were used to without skimping on power. And this mighty hub measures in at less than an inch thick, so it was easy to pack up to take on a trip. How many charging ports does the station have? The station has five charging ports total: one USB-C port and four USB-A ports. Does it need to be plugged into the wall? Yes, the charger needs to be plugged in to provide power to your devices. Will it work with my laptop? This charger is not for all laptop models. 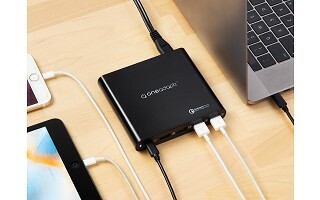 With additional DC laptop connector accessories, you can charge DC laptops. Please see guide to confirm the charger is compatible with your laptop. 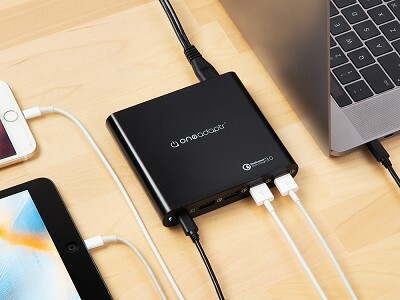 Compatible devices include: MacBook/MacBook Pro (up to 60W), iPad Pro/Air/Mini, iPhone X/8 Plus/8/7 Plus/7/6 Plus/6, Nintendo Switch, Samsung Galaxy Note 8, S9 Plus/S9/S8/S7/S6 and most smartphone, tablet, and USB devices. Quick charging from QC 3.0 port not supported on Samsung Galaxy S9 Plus.